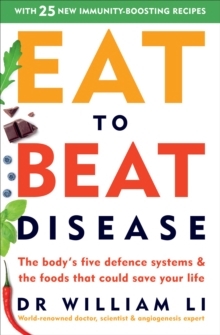 Is your diet feeding or defeating disease? We are at a turning point in our understanding of how to prevent and fight disease. Rates of cancer, heart disease, strokes, diabetes, obesity and other common health problems are skyrocketing. However, the latest scientific research and clinical evidence is revealing that the power to protect ourselves against these threats and resist them lies in a simple solution: the foods we eat everyday. 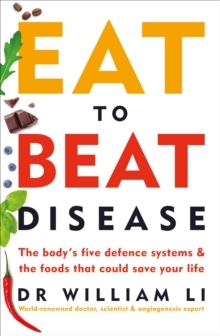 In Eat to Beat Disease, Dr William Li explains that your body was designed to fight threats like these and we have radically underestimated how food can be used to amplify this hidden power. Your body has five natural defence systems that, if functioning well, can protect you: angiogenesis (growing new blood vessels), cell regeneration, the microbiome, DNA protection and immunity. The healthy working of each has been found to be intimately connected to the foods we eat - and the findings are sometimes surprising. Discover: * Why scientists think drinking hot cocoa boosts stem cells crucial for your body's regeneration* The role of cheese and wine in maintaining healthy gut bacteria* Why drinking coffee lowers your risk of dyingRevealing more than 200 foods that you can incorporate into your life today to help you live longer, Dr William Li proposes a simple 5 x 5 x 5 framework, inviting you to choose five foods and eat them five times a day, to fortify your five defence systems. It is not about dieting or cutting out - it is about having the confidence to incorporate the healthy foods you already love into a plan for life-long change.